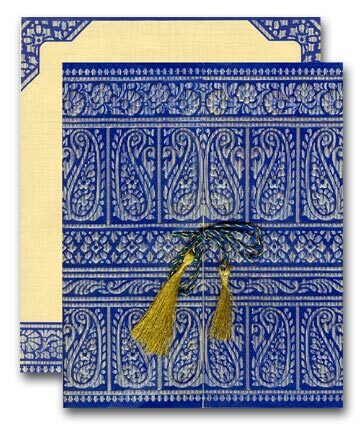 Paisley print with detailed self-embossing makes the invitation card a beauty to behold. The front has the door-open style and is tied by a tassel. 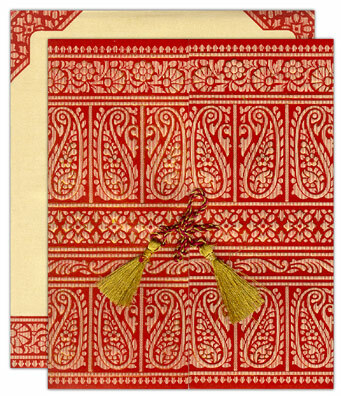 Size: 7.75" x 9.25" Weight: 75gms; Same as above, except golden-pearl printed front with self embossed motifs in rows; The two inserts are plain and the envelope has bordered detail. 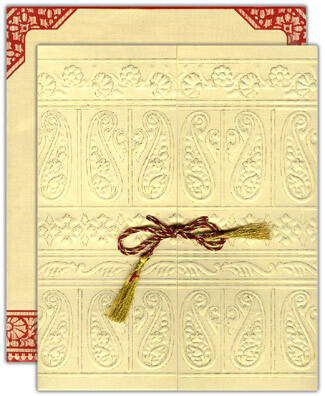 Size: 6.25" x 7" Weight: 65gms; Maroon handmade paper sheet, door open style card (300gsm), inserts are golden textured sheet and natural shade cream for envelope (100gsm). 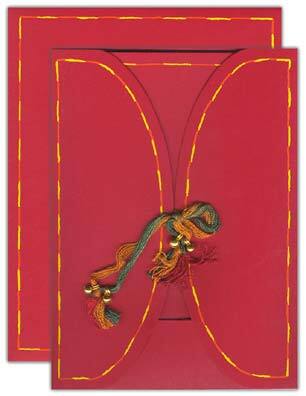 Size: 8" x 10" Weight: 70gms; This door open style card, tied by a silk ribbon has brown cloudy texture base over cream colored wooly paper, envelope in red colored paper (200gsm each), orange and light purple colored wooly paper for 2 inserts (70gsm). 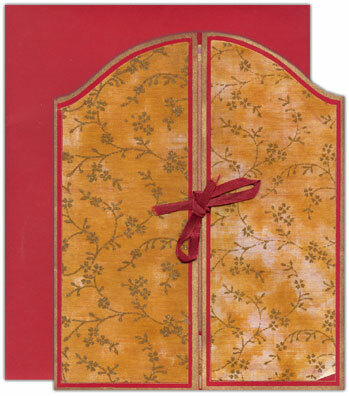 The front has golden borders and the paste-ups with a glitter floral image base in gold. The inserts have golden colored border design. The envelope is plain. A unique door open style invitation with dried original leaf pasted on the cover with traditional string border all around. Has two inserts with same string border. Envelope also in same material with the string border. Matching tassel closes the folding doors. 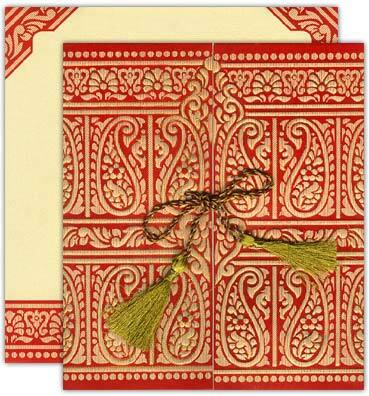 This red colored on off-white paper royal invitation with ribbed texture base, door open style card tied by a silken tassel with white vellum paper interleaf (200gsm), natural shade � off white paper with ribbed texture base for 2 inserts and envelope (200gsm each). 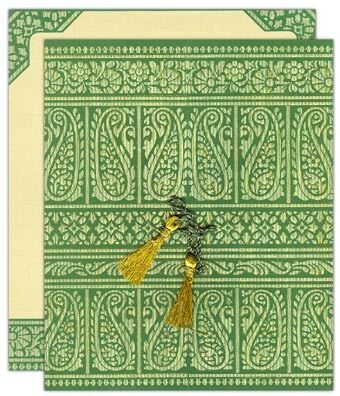 The front of this card shows a golden printed palatial door image having paisley motifs in gold and crystal highlights. The maroon and gold combination silken tassel ties the doors. The interleaf has an arch image border design in white with glitter floral motifs as base. The inner door folds have golden border. 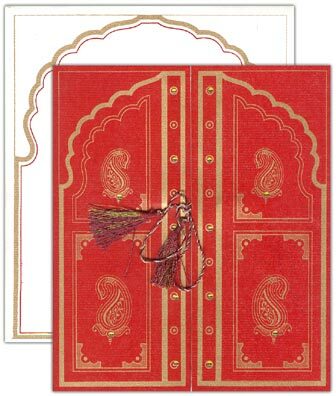 The inserts have been die cut in the arch style and have maroon borders with a golden image window design. 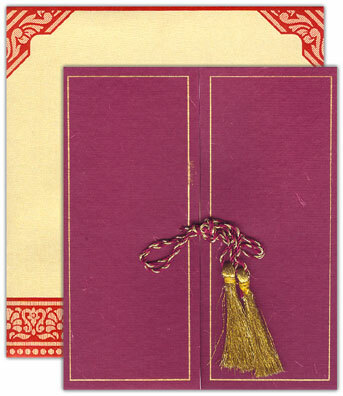 The envelope has golden and maroon arch style border accompanied by a golden decorative border at the bottom.